Doorknob Bags. 5.5" wide x 16" long. $6.90 for 100 or $17.00 for 300. Save with the triple pack! Canvas your neighborhood with these. Great way to introduce yourself and your company. I loved buying only 100 per set, Instead of 1,000 from another company. So, I ended up buying 3 sets or 300. Which works out perfect for me for a years worth of customers, and they fit my budget perfectly. I love that they are a tare off - this keep them from sliding off my prep table. I have since used a push pin on my peg board to store the rest. How nice not to store 700 extra in a box taking up room in my office!!! (flamingo's or cow's etc) and I leave a party bag on the door knob. For this I use these bags. I am able to fill the bag with a card from the sender, a wrapped cupcake, a candle, a party horn, our business magnet and brochure. I leave this behind on every order. The door knob bags are a quality product that withholds nicely, and I am happy to say holds everything perfectly in this bag. My customers love them because they are clear and so they know right away what is inside, and this way they know to open it instead of tossing it in the garbage like junk mail. I will be a lifelong return customer. 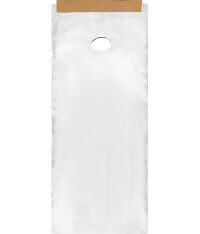 While I love the doorknob bags with all the pretty designs......I am loving the plain clear doorknob bags! They are on a tear off hanger so it makes filling them much easier! Since we don’t have an official catalog at this time I had some rack cards printed front and back that have info about me, our company, and our products and am adding a list of available scents in the bag along with a scent sample. Guests will have this bag that they can take home with them and they have something to add additional scent samples to that they win during a party. I bought these bags from My Girl Friends House and they work well, especially giving out invitations for my open house. It also protect your fliers from whatever the weather is, on that day. Love Them! !